When I made a spontaneous decision to keep my childhood friend Nastya company on a trip to participate in a volunteer summer camp in Iceland, there was no way for me to know what I had gotten myself into. I did not know that I had signed myself up for a 72-hour trip to the place of our destination which would include getting on and off two trains, a bus, and three planes. I did not know that I would sleep about ten hours during those three nights. I did not know that before I could go on that trip, I would have to endure the tedious process of applying for an Icelandic visa: throughout the five pages of the application form, you have to emanate the strongest unwillingness to emigrate to Iceland (emigrate to where?). I did not know that during the four months between the time when my friend Nastya and I applied for the project and the time we met in Saint-Petersburg to continue our journey to Iceland together, I would sometimes be so mad with her that I would seriously consider withdrawing from the project even though that would involve losing the money paid for participation. Because, even though we have known each other from the kindergarten, we are absolute opposites. I am a disorganized slacker whose whole life can be narrated as a chain of more or less successfully screwed up deadlines, and she is a meticulous, anxious planner. I live in a state of emergency and procrastination, while Nastya is a punctual and consistent hard worker. She started planning our trip even before our applications were accepted, and I had to participate, because she “could not do everything on her own,” which meant worrying about something that would not happen in four months. I did not know what would await me as a result of my impulse, but the moment I said yes, I regretted it, and immediately started to complain. I complained about the price of the airplane tickets. I grumbled about the inconvenient working hours of the visa centre. I lamented spending two weeks of August, the warmest month of the summer, in the place where I would have to wear sweaters, socks, and a raincoat to keep myself warm. I sadly contemplated the prospect of being one of the oldest participants (at the age of 28) in the camp as I went to the volunteer orientation where I was surrounded by youngsters any one of whom could be among the students I taught at Moscow State University. I shut up. I knew that I was not thrilled about going to Iceland, but I am a born nomad, and therefore any trip (even if it is an hour on a local train) makes me at least mildly excited. The truth is that complaining is what I do. Complaining makes me feel better. Things go wrong if you do not complain enough beforehand. If you get too happy about the upcoming trip, then nothing will go well on that trip. In early May of 2009, I was wildly joyous about my six-day getaway to New York. I even packed my bag a couple of days in advance which had never happened before. One day before the flight, the swine flu craze seized the world, and I spent six days wandering around in New York among people wearing face masks, as if I was an extra in an epidemic movie. I did not want anything to ruin my trip into the country of nowhere. When the bus from the Keflavik airport brings us to Reykjavik main bus station, we see a group of backpackers outside the entrance. About five or six people are sitting on the ground wrapped up in their sleeping-bags. One of them is frying the tiniest, saddest-looking pancakes in a small pan which she/he (it is impossible to tell because of his/her bundled up appearance) holds above a primus stove. It is two in the morning, and eight degrees Celcius. My regrets, which were more or less mitigated by the stop in Copenhagen and the thrill of a successful landing, are back. However, I check myself and don’t say what I think aloud. Hmm. Me too. But the fear that things will go wrong returns with a vengeance. In the volunteer hostel, I discover that tap water in Reykjavik smells of rotten eggs. Sulfur, that is, because in Iceland they use geothermal water which does not need to be heated for their centralized water supply. What was described in touristic blogs as a “mild smell” turns out to be a stench which makes me breathe hard to suppress vomiting urges while I attempt to brush my teeth in a somewhat clean bathroom. The bad feeling inside me is growing stronger. 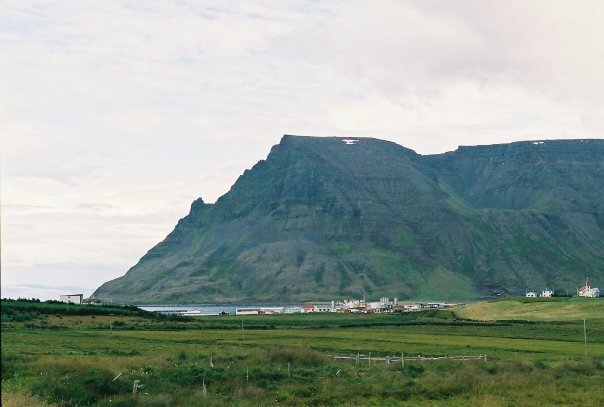 After we arrive to the town of Isafjörður, we discover that there will be no buses to Bolungarvik (which is located in 13 kilometers from the town) because it is the first Monday of August, an inexplicable Icelandic holiday during which Icelanders travel around the country. Since we are on a tight budget, Icelandic taxis do not interest us that much at first. However, we end up taking one anyway because we are too tired and the weather is too cold to walk that distance. I try hard not to complain. We come to Bolungarvik and, by chance, find out that our group meets in Isafjörður, because one of the local organizers screwed up something, but no one, since Icelanders are not in a hurry to explain anything, knows what. Nastya and I exchange glances, and I let out a slight whimper, because I feel the pressure building up inside. One of the villagers gives us a ride to Isafjörður. We spend an hour waiting for our camp-leaders to appear, and when it turns out that they were standing behind our car the whole time, I can’t help mentioning that our camp is obviously going to be led by a pair of idiots. Sleep-deprived, cold, and tired Nastya agrees with me way too quickly for a devout humanitarian. We meet our fellow volunteers in a bar: there are two guys and a girl from Spain who – in addition to our camp-leader Carlos, and a half-Spanish, half-Italian camp-leaderess named Sabrina – establish a tightly-knit Spanish-speaking diaspora; a French girl named Cindy and Quebecois Fred, who exchange remarks in their light bird language as Nastya and I sit down at the table and wonder whether we should order beer; an Italian ex-pat named Luca, who looks older than most of us (which makes me sigh with relief), and a Korean girl who might be younger than any of my first-year students. I look at these people, and realize that for the next two weeks I am going to spread love to the residents of Bolungarvik as well as share food, lodgings, and, most importantly, bathrooms with total strangers. Since the village of Bolungarvik is not ready to host us until the next day, we spend the night in the gym of the Isafjörður middle school. The Spanish-speaking bunch makes us pasta, and we eat it in awkward silence which at times is broken by our camp-leaders who are desperate to start team-building as soon as possible. I am in the daze of exhaustion. I do not talk or even listen; I dry the dishes moving my towel round and round and round the same dish. Once the dishes are dry, our camp-leaders suggest we play cards together. It is 8:30 pm on Monday, which is 11:30 pm in Moscow, and I haven’t slept properly since last Friday. I stand up and excuse myself from the communal activities. Nastya perseveres for fifteen minutes more, and then joins me on the floor of the gym. “Let’s sleep and see,” I mutter. The next day, we go to the local swimming pool for a shower. The water in the pool is slightly soapy to touch because it is geothermal, but the good news is that it does not smell of rotten eggs. Later, I learn that only in the northwestern part of Iceland the water does not have the sulfuric smell. The weather is still gloomy, the skies are low and grey, but it is not as cold as it was the day before. Or maybe it is a full night’s sleep that makes me more benevolent. Because I have nothing serious to complain about at the moment, I look at the low flat-top mountains with streaks of snow here and there on both sides of the fjord with its dark-grey water and they remind me of the place where Nastya and I used to live as kids. It makes me miss that place a little. However, I am suspicious of feeling too good, so I am preparing myself for some bad stuff in Bolungarvik. After lunch, our volunteer coordinator in Isafjörður brings a minivan to transport us to our future home. The minivan is not spacious enough to hold eleven people and all of our enormous luggage, but somehow we manage. I find myself squeezed in the right corner at the back row next to Pablo, a volunteer from Spain, and I notice that he is one of the cutest guys in the group. It makes me feel better as I am buried under somebody else’s 30-pound suitcase and my own backpack, which is the size of a well-fed baby elephant. The joke about the sardines in the can has always worked for me in similar circumstances, and it works this time as well. Our laughter shakes the minivan, where the only person not to laugh is our coordinator Ziggy who drives with an impenetrable look on his face. We start wondering if Vikings ever smile. In Bolungarvik, we learn that for the next two weeks we are going to live in a house which is the community center for local kids. It has a disco room with a DJ switchboard and a sound system, a room with one ping-pong and two billiard tables, a room with foosball and space hockey, and a Coca-Cola fridge, most probably donated by the local supermarket. Our group, most of whom have turned out to be in their late twenties, greets every new discovery with shouts of triumph. For a second, I am afraid that they are going to wake up some ancient Icelandic gods, who, even from my limited knowledge of Icelandic epic forms, I know were not that kindly disposed. Fifteen minutes after we enter the house, Nastya, Eunjin, Sabela and Luca are playing foosball, and I go to check out the kitchen area since I have a suspicion that I am going to be constantly hungry during this camp. On my way, I overhear Carlos and Sabrina discuss our camp’s fiscal state in the internet room, which holds the most contestable object of the camp — the computer. I learn that our prospects are not that bright — the budget for food is going to be five Euros a day for each volunteer. I do not have a clear understanding of how little it is, but I know that I am too old to be hungry and cold all the time, and I know who to blame for the situation I now find myself in. I tighten my jaw in frustration as I enter the kitchen, and it is then that I see it: the view of the mountain from the window. It is one of the highest mountains in the area — emerald green, with long grey patches and a couple of snow-white specks at the top. Its ridge descends down to the black cold sea in broken triangles. The mountain fills the whole window (and Icelandic houses have big windows!) as if our house stands right at its foot. It emanates calm and eternity. I stand in front of the window and look at the mountain. There is a red apple on the windowsill. A peal of laughter is heard from the ping-pong room. When I finally realize that for the next two weeks I am going to wake up before everybody else to drink my morning coffee in silence in front of this view, the nuclear explosion mushroom that has been growing bigger and bigger inside me begins to dissipate. I smile. I am not going to complain about anything this day, or the next one, or – for that matter – any day in the coming fortnight. Katya Kulik is a third-year graduate student in the Program for Writers at University of Illinois at Chicago. Prior to moving to Chicago, she lived in Ukraine, Siberia, Moscow, and New York. When she doesn’t grade or read for comprehensive exams, you can find her in the opera, at tango festivals, or at home writing short stories and memoirs or blogging at www.1001reasonsto.wordpress.com.